The Tomatillo (tom-ah-TEE-oh) Physalis philadelphica, also known as “tomate verde” (green tomato), husk tomato or jamberry, is a member of the nightshade family along with tomatoes, potatoes, peppers and ground cherries. 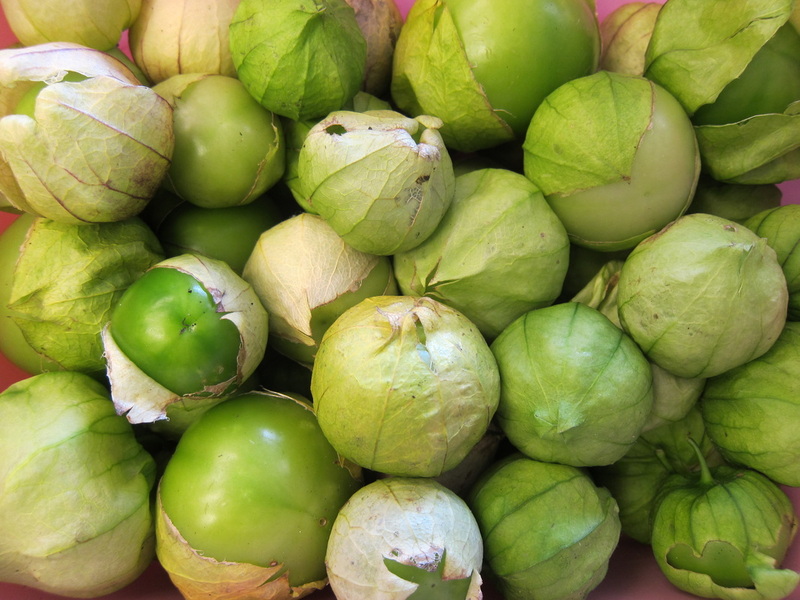 Tomatillos are used both raw and cooked in many Mexican recipes such as salsas, gazpacho, and guacamole. Substituting tomatillos for some of the avocado makes a lower calorie guacamole. Tomatillos grow inside an inedible, papery husk. When the tomatillo fills the husk it is ready to pick. They should be bright green and firm and will vary in size from one to two inches in diameter. When the husk is removed the tomatillo inside will be sticky. The sap should be washed off but the tomatillo does not need to be peeled or seeded. When cut they are a very pale green and meatier than a tomato with many tiny seeds. Tomatillos are a good source of vitamin C.
Overripe tomatillos will turn yellowish green and be milder and sweeter than the characteristic tart citrus flavor. Smaller tomatillos also tend to be more sweet as are the purple to reddish varieties which are sometimes referred to as "jamberries" and are used to make jam or preserves. The significant amount of pectin in tomatillos actually makes them ideal for jam. Salsa made with roasted or cooked tomatillos will gel when cooled. 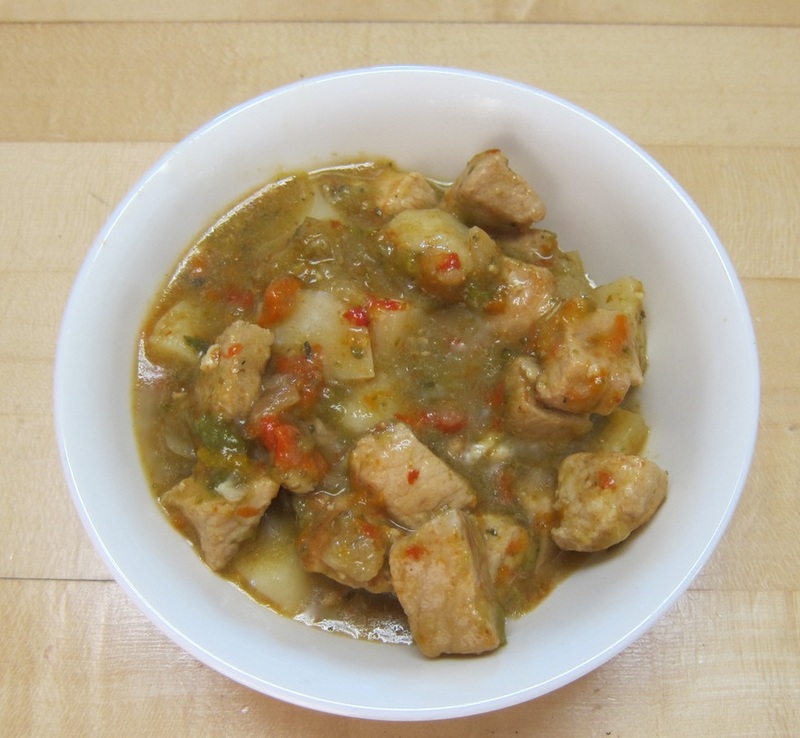 Adding tomatillos to a stew will not only thicken the stew but will also give it a rich flavor. Tomatillos can be blanched in boiling water for a more mellow flavor, but they get mushy. This is fine for recipes where they are to be crushed or pureed but they are too soft to use in some recipes. They can also be fire roasted like peppers, either over a fire or under the broiler but again, they will get soft quickly. The temperature must be hot enough to sear the outside without cooking the tomatillo. The blackened skin will add a smoky flavor to a recipe. Ripe tomatillos will keep several weeks in the refrigerator in their husks. One (11-ounce) can of tomatillos equals one pound of fresh tomatillos. Canned tomatillos may be used in place of fresh ones in any dish that will be cooked. One pound of fresh tomatillos equals one 11 ounce canned tomatillos. In a blender combine tomatillos, cilantro, ancho peppers, jalapeño pepper and tomatoes until they are a smooth puree. This may need to be done in smaller batches. 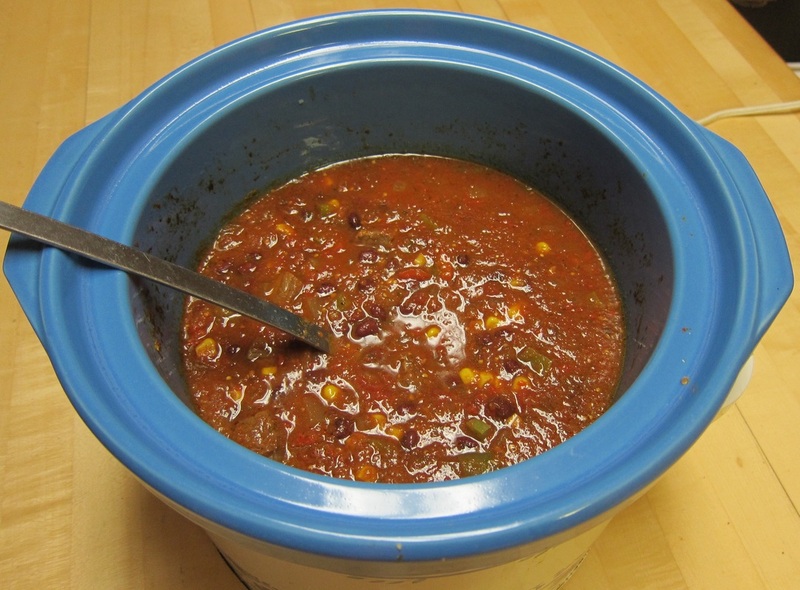 Transfer the mixture to a 5- to 6-quart slow cooker. Season the meat with salt and pepper and fry in olive oil in a heavy pan over medium high heat. Remove the meat and add to the slow cooker and add 1 Tbsp oil to the pan and fry the onion, bell peppers and garlic until the onion is translucent (about 3 to 5 minutes) then add to the slow cooker. Stir in beans, corn and chili powder and cook on low or 8 to 10 hours. Ladle into bowls and top with sour cream or shredded cheese. In large pan over medium heat, saute the celery, onion, carrots, peppers and tomatillos in olive oil. Add oregano, thyme, sage, cumin and salt. Add water to cover and simmer until tender, then add the juices and cilantro. Season with salt to taste. 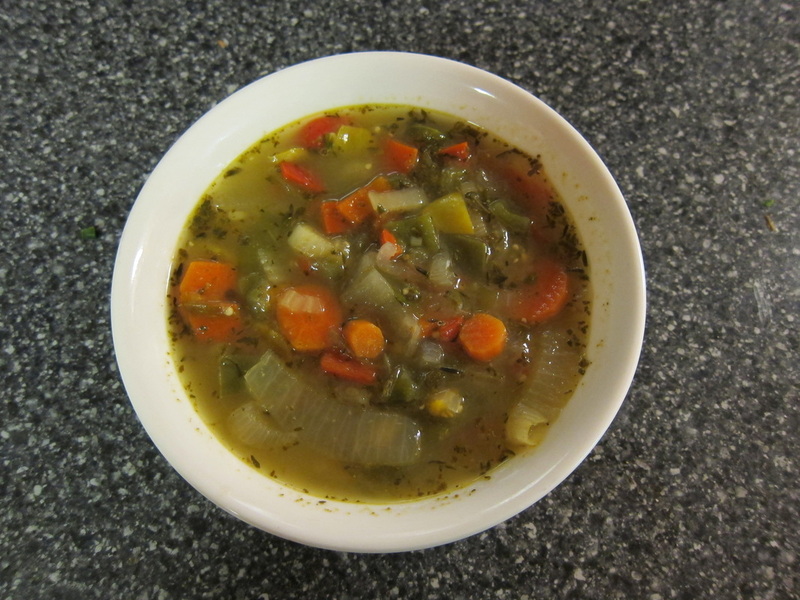 This is a rather colorful and very flavorful vegetable soup. Serve with a slice of warm bread for a hearty lunch. Puree three of the tomatillos in a blender until smooth and pour them into a large slow cooker. Chop the remaining tomatillos and add them to the slow cooker with the rest of the ingredients. Cover and cook on low for six to seven hours. Remove the chicken and shred it. 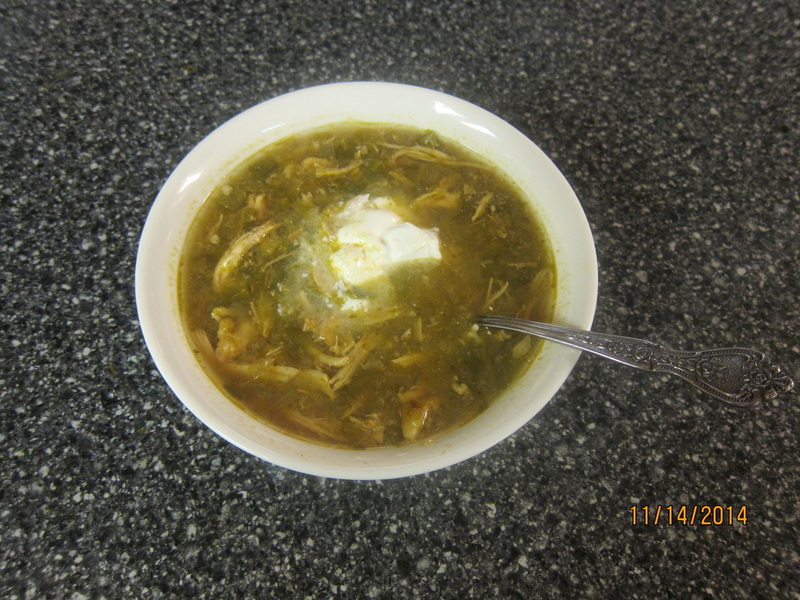 Return the shredded chicken to the soup. Serve topped with sour cream, fresh snipped cilantro and tortilla chips, if desired. (Serves four to six people). Don't let the green color put you off. This soup has a rich hearty flavor. Broil the peppers on a cookie sheet close to the broiler element, turning occasionally until charred on all sides (see the entry under “Poblanos” on the Pepper page for more information. Remove from the heat and cover or put them in a covered container to steam). While the peppers are steaming, arrange the tomatillos on the sheet pan and broil until charred, turning as needed, 5 to 10 minutes. Peel and remove the skins, stems, and seeds from the peppers; the tomatillos do not need to be peeled. Chop the peppers and tomatillos and set aside. Heat oil in a large Dutch oven over high heat and brown the pork on all sides. Work in small batches so you don’t overcrowd the pan. When all the pork is browned, return it all to the pan and add the onions. Cook about seven minutes, until the onions are translucent. Add garlic, cumin, oregano, and bay leaves and cook about 1 minute. Add vinegar to deglaze the pan scraping up any leftover browned bits. Pour in the chicken stock, reserved peppers and tomatillos. Bring to a boil. Reduce heat, cover and simmer until the pork is fork-tender, about 2 hours. Peel and dice the potatoes and add them to the stew. Cook 30 to 40 minutes until the potatoes are done. Season with additional salt and pepper to taste. Again, don't let the appearance freak you out. I used some red poblanos (just because I had some) so that's the red flecks in the picture. In all honesty, it is a rather sickly green color but it's worth it for the taste! 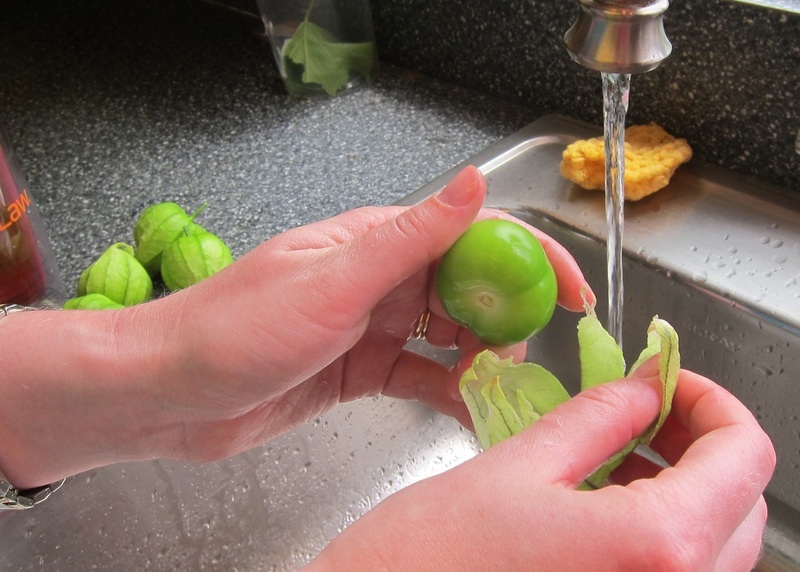 Remove the husks, wash and cut the tomatillos in half. Place the tomatillos, jalapenos, onion wedges, and garlic on a roasting pan and broil about 5 minutes until the tomatillos are soft and slightly charred. Allow to cool. Split the jalapenos and remove the seeds. Chop the vegetables and the juice from the pan slightly in a blender, but do not puree them. Add the cilantro, lime juice, and about ¼ teaspoon of salt and pulse a few more times. Pour the sauce into a crock pot. Combine 3 tablespoons of flour and 2 teaspoon salt and coat the cubed pork. Brown the pork in hot oil. Remove the pork from the pan and add it to the crock pot. Add the sherry to the pan to loosen the browned bits left in the pan. Scrape the pan and add the browned flavor bits and sherry to the crock pot. Cook on low at least 5 hours. Serve with rice. Place chili peppers, tomatillos, tomatoes, onion, and garlic clove on a baking sheet in a single layer; broil 3 to 5 minutes on each side until blackened. Remove from oven. Place the blackened hot chili peppers in a bowl, cover with plastic wrap or an airtight lid, and allow to steam for 10 minutes. After 10 minutes, remove chili peppers. Using a sharp knife, remove stems, skins and seeds. Roughly chop tomatillos, chili peppers, and onion. Place in food processor or blender and add the garlic, cilantro, and lime juice. Pulse until smooth. Mash the diced avocados and combine with the guacamole mixture. Season to taste with salt and serve with chips. Remove the husks and wash the tomatillos. Cut into chunks. Cut the stem off of the jalepeño and quarter it. If you want a more mild salsa, remove the seeds. Put all the ingredients into a blender of food processor and process to a coarse puree.